The southern edge of Devon Island Ice Cap in Nunavut, Canada, lies within the research area, where long-term data are being collected to study global warming. Permafrost is a thermal condition—its formation, persistence, or disappearance is highly dependent on climate. Its distribution, temperature, and thickness respond to natural environmental changes and anthropogenic disturbances that cause an alteration to the ground thermal regime. Changes in air temperature and/or precipitation, or surface disturbances due to clearing of vegetation, removal of insulating organic layer, forest fires, river channel migration, shoreline erosion all may produce a modification to the ground thermal regime. The interaction between the climate above the ground and below the ground is complex, and dependent on several factors. Changes in climate above the ground are most often dampened below the ground due to the insulating effects of vegetation, organic material, or snow cover. There is generally a lag between a temperature change at the ground surface and a permafrost change at depth. For thick permafrost, this lag may be on the order of hundreds to thousands of years, for thin permafrost, years to decades. The Geological Survey of Canada's (GSC) ongoing monitoring programs in the Mackenzie Region focus on studying the interaction between permafrost and climate. Not all permafrost in existence today is in equilibrium with the present climate. Offshore permafrost beneath the Beaufort Sea is several hundred metres thick. It was formed when the shelf was exposed to cold air temperatures during the last glaciation. This permafrost is presently in disequilibrium with Beaufort Sea water temperatures and has been slowly degrading. General circulation models predict that, for a doubling of atmospheric concentrations of carbon dioxide due to anthropogenic sources, mean annual air temperature may rise several degrees for much of the Arctic. In the discontinuous permafrost region, where ground temperatures are within 1 to 2 degrees of melting, permafrost will likely ultimately disappear as a result of ground thermal changes associated with global climate warming. Where ground ice contents are high, this permafrost degradation will have associated physical impacts. Of greatest concern are soils with the potential for instability upon thaw (thaw settlement, creep or slope failure). Such instabilities may have implications for the landscape, ecosystems, and infrastructure. An assessment of the impact of climate changes on permafrost is necessary to determine whether adaptation measures will be required. The Canadian Permafrost Monitoring Network provides long-term field observations of active layer and permafrost thermal state. The observations are essential for understanding the present permafrost conditions and the detection of the terrestrial climate signal in permafrost and its temporal and spatial variability. This network contributes to the Global Terrestrial Network for Permafrost and Canada's obligations to provide systematic cryospheric observations under the World Meteorological Organization's Global Climate Observing System. The GSC is responsible for coordinating and implementing the framework and infrastructure for the network. About 75 thermal monitoring sites are operated by government and University scientists. The GSC maintains a network of over 20 thermal monitoring sites. The boreholes are generally up to 20 m deep. They were established in the mid 1980s in the Mackenzie Valley and Delta, some of which operate in collaboration with Environment Canada and Agriculture Canada. The GSC also operates a network of 60 active layer monitoring sites in the Mackenzie region using thaw tubes. The GSC maintains a network of High Arctic permafrost temperature observatories, including five boreholes at Canadian Forces Station (CFS) Alert. 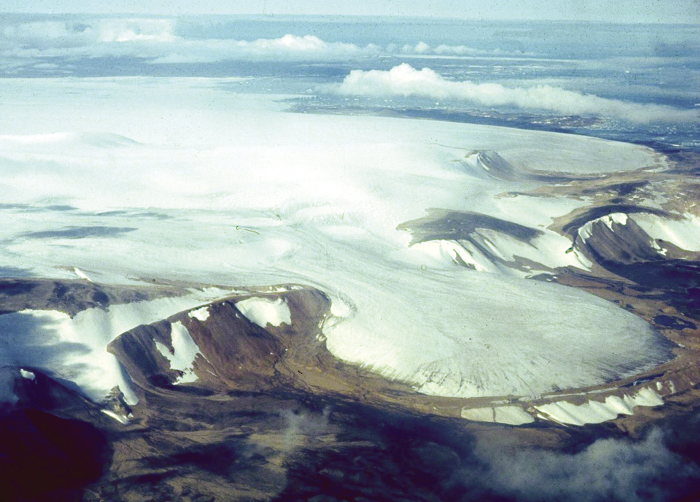 In the late 1970's, five permafrost ground temperature boreholes were instrumented at CFS Alert (82.5°N, 62.4°W) on the northern tip of Ellesmere Island, Nunavut. Permafrost ground temperatures at depths of up to 60 m have been measured manually at these sites since 1978. The boreholes represent the most northerly permafrost thermal-monitoring site in the world, and are an important contribution to the recently established Global Terrestrial Network for Permafrost. The 23-year data set is one of the longest records of permafrost temperatures in Canada. The boreholes are maintained collaboratively by the Department of National Defence (DND) and the GSC. In 2002, GSC collaborated with Environment Canada's snow monitoring network to install Campbell Scientific meteorological sensors. These consisted of air temperature, wind speed, and ultrasonic snow depth sensors at GSC sites: three at the high Arctic site at Alert, one at a low Arctic site at Baker Lake, and one at a Boreal forest site near Wrigley in the Mackenzie Valley. The sensors are measured using a CR510 datalogger, and an external SM4M storage module provides additional data storage because the stations are visited infrequently. Power is supplied by a 26 Ahr battery charged by a 10 W solar panel. The high storage capacity of the battery is required to ensure operation through the long polar night. There are plans to install more stations in the summer of 2003 at other GSC sites. These weather stations provide information on the spatial and temporal variability of snow cover and on the local microclimate at each site. The data generated will be used to further our understanding of the response of the Canadian cryosphere to climate change and variability. The climate at Alert, typical of the cold polar desert climate seen throughout most of the High Arctic Islands, is cold and dry. The mean annual air temperature is -18.1°C and mean annual ground surface temperature is about -16°C. The 30-year normals for precipitation show 16.2 mm of rainfall, with a mean total annual precipitation of 153.6 mm. Permafrost is over 600 m thick. Although snow cover is generally thin to absent in this area, it exhibits high spatial and temporal variability. The snow cover is an important factor influencing the response of shallow permafrost temperatures to changes in air temperature. The weather data will aide the analyses of the local microclimate's role in influencing the permafrost response to air temperature changes.